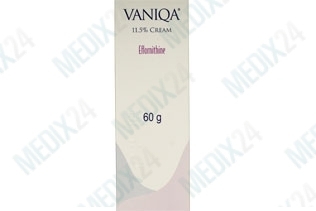 The active ingredient in Vaniqa, eflornithine, slows down the growth of hair. It realises the slow down by the effect it has on a specific enzyme in the body, that is involved in the growth of hair. Effect: reduces growth of excessive hair on face of women older than 18 years. You must apply the cream to the skin twice a day with intervals of at least eight hours. Vaniqa must be massaged on the skin and be allowed to work for at least four hours. If you have just removed your hair, we advise you to wait a while (at least 5 minutes) before applying Vaniqa to avoid skin irritation. If you desire a continuous effect of Vaniqa, you can start a long-term treatment, because when you stop using the product, the results of the treatment are gone after about eight weeks. How does Vaniqa hair removal cream work? Vaniqa contains an enzyme, eflornithine, that is responsible for regulating the growth of cells, in particular of hair roots. By using Vaniqa, this enzyme prevents the formation of new hair and slows growth down. To rule out underlying diseases as a cause of excessive hair growth, it is advisable to have a survey carried out by the doctor should hair growth occur suddenly. The use of some medicines may also cause the growth of hair. There are no known important interactions between Vaniqa and other medicines. If you experience any unusual symptoms while using Vaniqa and other medicines you should tell your physician.